1. 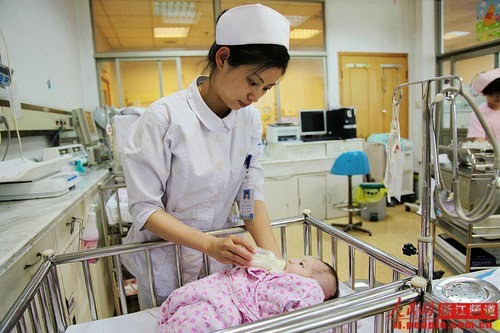 China has a huge shortage of midwives, and would need a further 800,000 to meet the WHO standard of one for every thousand women of child-bearing age, according to a new report. Health officials say the problem will worsen as China adopts a two child policy. 2. Efforts to control pneumococcal disease and Haemophilus influenzae type b (Hib) in children by vaccination are failing due to low immunisation rates and delayed immunisation, a study from Shanghai shows. A review of vaccination records for 28,000 children up to the age of seven found that 51% had one dose of Hib vaccine and 11.4% had one dose of pneumococcal vaccine. Only 8.2% of children had Hib vaccine at the right time and only 0.5% had timely pneumococcal vaccine. Rates were particularly poor for migrant children, the study found. 3. Rates of hypertension have increased in China and yet treatment and control of the condition remain poor, according to researchers from Shandong. In a study of more than 4000 people they found that the incidence of hypertension increased from 2.9 per 100,000 people in 1991–1997 to 5.3 in 2004–2009 Antihypertensive treatment and control rates for hypertension were 5.7% and 1.7% in 1991–1997 and 19.9% and 7.6% in 2004–2009, respectively. 4. The rate of disabilities from road crashes in China has skyrocketed as the number of cars on the road has increased over the last two decades. The incidence rate for road traffic disabilities increased over time from 1.50 per 100,000 people in 1980 to 11.2 per 100 000 persons in 2005, according to Professor Zheng Xiaoying of the Institute of Population Research, Peking University. 5. Malaria is still a major problem in central China especially during floods and rainy periods of the summer. A study from Mengcheng County, Anhui found that there were 3683 malaria were notified during the study period of May to October 2007 Most of the cases occurred a week to a month after flooding and waterlogging. Public health action should be taken to control the potential risk of malaria epidemics after wet weather, the researchers from Shandong University said. 6. The recent outbreaks of H7N9 avian influenza also resulted in many mild and asymptomatic infections as well as severe life threatening cases, researchers from Guangdong have reported. Their surveillance program noted 21 cases of infection in Guangzhou, China in 2013 and 2014, of which several were mild or asymptomatic infection. Family clusters occurred, suggesting limited person-to-person transmission of the H7N9 virus, they said.